“This talk of violence and hard borders is careless in the extreme. Establishment news network Sky aired an interview on Sunday, where Blair said that the UK making a clean break the bloc on March 29th without a deal — and without having to pay the £39 billion divorce bill or remaining in regulatory alignment for a further near-two years during the transition period — would “potentially be devastating” for the peace process in Northern Ireland. “You would have a hard border, a very hard border. “A no-deal Brexit means a really hard border between north and south in Ireland. It’s contrary to the Good Friday Agreement and it will cause an enormous fissure within the United Kingdom,” the former Labour leader said. 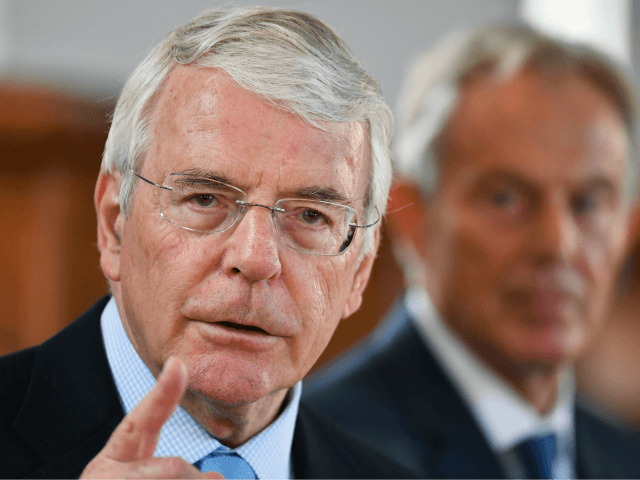 Also on Sunday, The Times published an interview of fellow Remainer and former Tory Prime Minister John Major where he alleged that violence would return if the whole of the UK left the Customs Union without a trade deal in place, evoking memories of IRA terror victims and implying Brexiteers would be to blame if people died as a result of a new era of the Troubles. Members of the unionist party have repeatedly stated that there would be no need for a hard border or customs infrastructure in the event of a no-deal. DUP leader Arlene Foster pointed out in January that there had never been a hard customs border, with infrastructure during the IRA terrorist campaign being for purely security reasons, and advocated for technological solutions as the way forward for customs checks. The DUP also maintained that Brussels was using the Irish border issue as a means to eventually cut off the country from the rest of the UK. “The IRA terrorist campaign was designed to remove Northern Ireland from the United Kingdom. We resisted that and will resist any deal with Brussels which is designed to do the same thing,” DUP Brexit spokesman Sammy Wilson said in November.